I thought I'd talk for a minute about writing the AGoogleADay puzzles, using yesterday's puzzle as an example. Your name is Galloping Gertie. How many furlongs long are you? There are a few constraints on the AGAD puzzles. They have to be short (less than 140 characters in order to fit both in Tweets and onto the page design for the NYTimes print format). They have to be interesting. And they have to illustrate some point about search skills. 1. "Galloping Gertie"? What's that? Don't be fooled by the rest of the puzzle statement, and in particular, don't be fooled by the use of the present tense. (A few people complained about this in the Twitter stream. As a puzzle this makes it interesting. Here's why. If you do [ galloping gertie ] you'll quickly find out that this refers to the Tacoma Narrow bridge... the one that was destroyed by resonant oscillations caused by wind through the narrows. That's easy enough. 2. What was the length of Galloping Gertie? Be careful here. They rebuilt the bridge at the same site, but that has a different length. If you read carefully, you'll see that the OLD bridge (the true "Galloping Gertie" of 1940) was 5939 feet in length. In this step, you just have to be careful to get the right length! 3. Convert 5939 feet to furlongs--easy, just use the Converter in Google. [ 5939 feet in furlongs ] and you'll have the answer. This is a typical AGAD problem. It takes a few steps, usually requires some special care at one point, but it's not intractable. As I mentioned yesterday, I was at ISTE in Philadelphia all this week. When I showed AGAD to teachers, they were nearly all intrigued and thought this was a great idea. I agree, although I find that people can be SO picky about the questions. Mostly when people complain about the AGAD questions it's because they think they have the answer, but on close inspection, they usually stop one question too soon and answer the question they THINK they read. But no. This is probably the biggest source of problems. A branch of the U.S. armed forces with the motto "Semper Paratus" runs a training facility in Northern California. Approximately how many people are trained there each year? Who knew? That's one of the great things about this kind of work. You're always learning something new. And while at ISTE, I showed a few teachers some very short lesson plans I'd prepared based on AGAD questions. They were pretty positive.... and so I'll show you some other these soon as well. I'll send these out for your feedback soon (later this week). Wednesday Search Challenge (June 29, 2011): How many furlongs is Galloping Gertie? Google has a large booth here, and I'm interviewing teachers and technology coordinators about how they teach students to search and what problems arise in how kids learn how to do research. More on that later as well. Tomorrow will be a lovely, quiet day. More thoughts about the ISTE conference (and a a discussion of the answer) tomorrow. 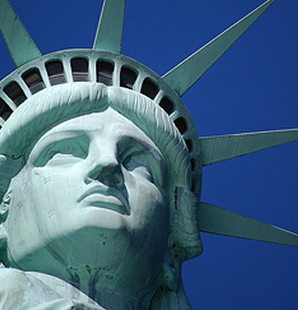 Answer: Two images of the Statue of Liberty? As you can see from the comments, there are multiple ways to solve this problem. And that's great! Nice job, search detectives! But I used the new Search-By-Image feature (see the Inside Search Google site about SBI for details) to figure this one out. Nevertheless, I solved the problem in this way.... I put the two images off on the side of my desktop, then dragged them into Google Image search query box and looked at the results. Easy. Once I'd done that, it was pretty straightforward to compare the kinds of results I was seeing, and notice that the second image was the same image as the one on the Liberty stamp. For bacground, here's the YouTube video some folks at Google put together to show how SBI works. Wednesday Search Challenge (June 21, 2011): What's the story with these two pictures? What's the story with these two images? As you can see, they're pretty similar, yet my friend assures me there is a strange-but-true story about one of these images. And, drat him, that's all he'll tell me. "You'll figure the story out for yourself, once you know how to search for it..."
abstract: Sensemaking is what you do when you collect, organize and restructure information to come to some deeper understanding. In essence, it's the process we follow when we research complex historical topics... or when we're buying a refrigerator. I'll talk about ways that people do sensemaking, some best practices and how you can improve your sensemaking behavior. Note-to-self: Because there are a wide variety of people signed up for this webinar, I'm really not sure at what level to pitch it. There are elementary school teachers signed-up and research managers from DARPA. Uh oh. That's a big dynamic range to try and teach in one class. Remember for next time--describe the level of the class more accurately! I'm going to try and make it both a graduate level seminar AND a practical guide to sensemaking. If you attend and have any comments, please let me know. I'd love to hear your feedback. Answer: Which sword is larger? Answer: the one in Germany is larger. Now, how do I know? First, start your search with the obvious--what the heck is a "Varusschlacht"? Clicking on the Wikipedia article (and perhaps translating it from the German) you'll find that this is the German term for the Battle of the Teutoburg Forest, a victory for the German tribes (led by Arminius, who was later known as Hermann, for various obscure reasons) over three rather well-equipped Roman legions. It is said that when the battle site was rediscovered it was a "debris field" 15 miles long and up to 1 mile wide. This was a BIG battle. As you can imagine, this has been a point of German national pride for a long time, ever since it was written about by Suetonius in his classic book De vita Caesarum ("On the Life of the Caesars") and then picked up later as an unforgettable tale of Germanic superiority. In any event, the in the middle 1800's, the Germans built a mighty statue, the Hermannsdenkmal in Ostwestfalen-Lippe in Germany in the Southern part of the Teutoburg Forest. On the Wikipedia article it's noted that the sword is 7 meters long. A quick search for other sites show confirmation--so I believe the Hermannsdenkmal statute sword is 7 meters (22.96 feet). But, interestingly enough, German emigres ALSO built a near-duplicate of the Hermannsdenkmal near New Ulm in Minnesota. And here's where the search gets fun. From the Wikipedia article it's simple to find the Hermann Monument near New Ulm in Minnesota... and all kinds of information about it. But not the sword length. So we're going to have to use more direct means. It's simple to search for various images of the Hermann Monument. 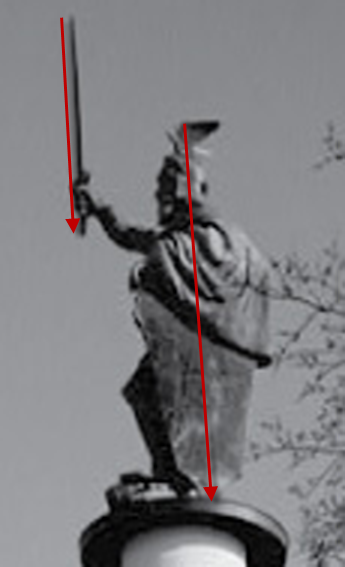 It's easy to find the height of the statue by doing a quick visual analysis of an image. From the official Hermann Monument site I found this nice image of the statue. Using my favorite image editor, I drew a couple of lines--one for the sword, one for the height of the statute. By measuring the length of the lines in pixels (an easy thing to read off from the editor as you're drawing), I find that the length-of-sword / height-of-statue is 219 pixels / 382 pixels... or 0.57. 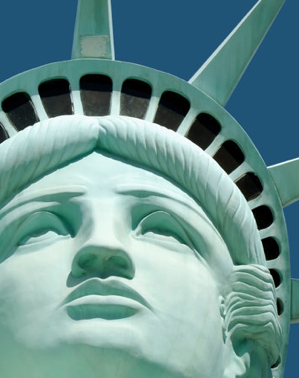 I know from reading the official web site that the statue (without the pedestal) is 26.2 feet tall... so, 0.57 * 26.2 = 15.39 feet. This is pretty simple photogrametry, but it's a nice example of deriving simple facts from indirect measurement. 1. Unusual words (such as "varusschlact") can be translated, or the web pages they lead to can be translated. You can them work back to English sources (or work directly from the German pages). 2. Sometimes you just have to measure things directly, or in this case, indirectly by measuring properties of the photograph. Wednesday Search Challenge (Jun 15, 2011): Which sword is larger? The past week has been a bit busy... sorry about being offline all last week! The AGoogleADay.com stuff heated up, and I ended up giving a few talks here and there, etc. etc. It was all good stuff, I just can't quite make extra time appear out of nowhere. "But enough of that!" I hear you cry. "Where's the Search Challenge?" In writing questions for AGAD.com I end up spending a lot of time doing background research on topics that are fascinating, but that often don't end up yielding anything useful for my questions. But it's endlessly interesting. I started reading about the Varusschlacht, and ended up spending a completely fascinating and absorbing hour reading a tale of lost Roman legions and battlegrounds that lay undiscovered for centuries. their sizes, can you figure out the length of the sword each figure is holding aloft? Which statue has the larger sword? I wanted to understand how/why and how-much money was involved in the landings, what was being exported, and what lead to their eventual disappearance. I knew that there was Cooley's Landing in Palo Alto, Dixon Landing down in San Jose... and I knew of Guth's Landing. I figured that was a fairly rare term ("Guth"), so I started with that. 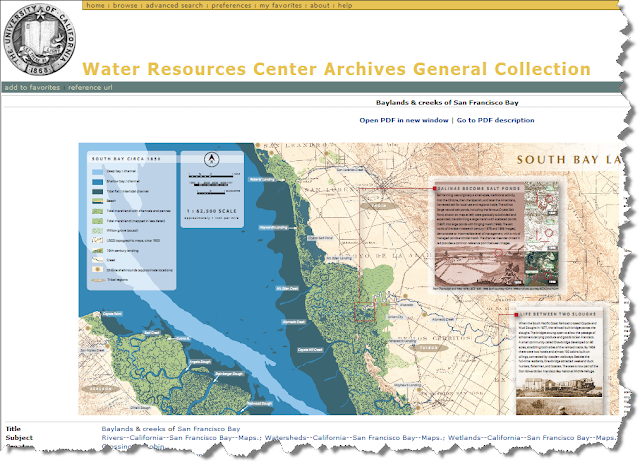 ... and THAT got me to this remarkable map produced by the City of Oakland Museum! If you click through to the link (caution: it's a slow download), you can get the PDF of the map and just read-off all of the landings around the South Bay. And the text on the map gave me a bit more insight. There's a panel about the city of Drawbridge which was a small town with two hotels and duck-hunting cabins that was created when the railroads built a bridge across the bay in 1877. That's a useful date to remember. (The 1800..1900 restricts numbers between those years in the results.) The first hit in the list was for a historical note about Roberts Landing. Although that's really mid-bay, I figured it would be useful. And it was. "Captain William Roberts established the port in 1851 to take locally-grown hay, fruits, and vegetables across the Bay to San Francisco. Warehouses and docks were built here along the slough. Flat-bottomed two-masted scow scooners sailed in and out of the slough at high tide. Roberts Landing lasted until the 1870's. It was put out of business, like many other transportation ventures on the Bay, by the transcontinental railroad." That's the first bit of evidence: The landings were primarily for "scow scooners" that could get in/out of the sloughs at high tide. And it looks like the cheaper/faster rail transportation spelled the end for the landings system. Now I've got an idea. That phrase, "scow scooner" sounds like something that was particular to this time and place. I poked around a bit, and quickly discovered that the conventional spelling is "scow schooner." The results look great. Turns out that there's still one of these ships around, berthed at the Hyde Street Pier (in the middle of Fisherman's Wharf in San Francisco). The Wikipedia article on the Alma is pretty good. From that article: "Like the many other local scow schooners of that time, she was designed to haul goods on and around San Francisco Bay...carrying hay and lumber..."
I also found what looks to be a fabulous book "Scow Schooners of San Francisco Bay," but while it's IN Google Books, it's not viewable, which is a pity. (If I could see it, there's a good chance I would have bought.) But Google Books told me it's in the Mountain View Library, so I'll go pick it up there. Until then... I also found from this search (via the Rengstorff House site) that Rengstorff Landing was used for shipping farm products (primarily hay, barley, wheat, lumber) and people in the era before bridges crossed the bay. I also found that Henry Regstorff's landing journal (daily shipments invoices!) from 1879-1883 was recently found and has been digitized... but it not yet on the web! Luckily, my bike path to work happens to pass the Rengstorff House, so I'll stop in there to see what they can show me. I started to focus on finding information about particular locations. Now that I knew about Rengstorff Landing, what about the others? To find out more, I zoomed in on the commercial aspects of the landings. At the same time, Cooley Landing (the next landing to the north) was specializing in brick export. In 1873, William Hunter and Thomas J. Shackleford, searched for clay suitable for bricks and a site for a new brick plant. Finding both on the property of Lester P. Cooley at Ravenswood (now East Palo Alto), they set up a brick foundry on five acres of land near Cooley's Landing, opening their factory in 1874. This included seven field kilns and a number of pugmills. Wood for fuel was hauled from the mountains just to the west. The clay pit (site now Jack Farrell Park) was north of the kilns. They ran rail cars to Cooley Landing and shipped bricks to San Francisco using their own ships "Dora" and "Heckla". They produced about 40,000 bricks a day, or around 40 million during the 10 years of operation before exhausting the clay pit. This image from CalBrick's history of brickmaking in San Francisco shows Cooley's Landing, with two brick kilns and the short railway to the Landing. A scow is heading out with a delivery. From Moore and DePue Illustrated History of San Mateo County (1878). The end of the landings: The age of the landings seems to have petered out around 1900 when the first rail lines (established in 1880's) started to haul the fruit from orchards and hay to the cities more rapidly and reliably than tide-bound scows. They settled into other roles--Cooley Landing became a dump and a base for bridge construction. It's now closed to the public, and rotting away slowly. All of the other landings are long gone. Some of them have been buried in landfill (Guth's Landing is now part of a business district), and others like Dixon Landing or Mowry Landing are placenames only. What does this tell us about search? The first and most obvious is that I wasn't able to find any economic data about the landings. They were clearly important, perhaps even essential to the developing economies of the lower San Francisco Bay region, but it's hard to be sure of that without at least an estimate of the total volumes of products shipped out via the landings versus the quantity that was shipped via roads or rail. So... until someone writes an article or book about the details of the economies of the South Bay, it's hard to get beyond what we've found so far. Or... I'll have to go around to the libraries and check out those books, dig up those journals and do old-fashioned legwork the way you used to have to do. It's like research used to be: Stuff is scattered all over, and you need to do some work to assemble the collection of information you need. Old place names: Some of the searches I did were spectacularly unhelpful. A query like [ "mowry landing" history ] triggers a bunch of sites that seem to exist only to fill in the blank spaces. Very little could be found that was real information. Luckily, these poor quality sites are easy to recognize as junk. Shipping on the Bay seems to have been at its peak between 1840-1870, when the railways took over. Ports: Aviso, Cooley, Rengstorff, Ravenswood, Warm Springs, Redwood Landing, etc. Products: Primarily produce from Santa Clara valley, but also quicksilver (from the Almaden mines), redwood lumber, wheat/barley/flour, and passenger traffic. Some of the products were shipped as raw materials (the barley to a SF distillery, but processing plants were also built at the ports, (e.g. fruit canning & tanneries). There were tidbits in each of historical backgrounds for Cooley and Rengstorff and a nice payoff for when I found Alviso. I'd swap in different cities as discovered and used "19th century" or "agricultural shipping" once I discoved the main products. If I were going to be methodical about it, I probably look at the history of each of the bay area cities. Lacking a book in regional history, that seems to be the best source (along with those development plans!) and piece it together. Interesting how once-thriving places (the formerly thriving cities of Ravenswood or Alviso) are basically non-existent today, primarily because of the railways. Okay.... since this is a reasonably hard problem, I'll add a day onto it. I'll write up my answer tomorrow! It's time to up the level of our game and tackle not just a query problem, but a real sensemaking problem. Note that I have not yet solved this problem, but I hope that we'll be able to do some kind of collective sensemaking operations on this together. In the southern parts of San Francisco bay there was (historically at least) an extensive marsh & slough system. And in days of yore, there grew a number of landings where boats could sail up and dock to onload / offload goods. Something I've wondered about for a while is how well this all worked. In particular, WHAT came on and off those boats, and how long did the whole "landings" economy work out? To get you started, one of the best known landings was Rengstorff Landing in Mountain View. (Yes, it' was very close to the Googleplex.) Another was Cooley's Landing in Palo Alto... but there were many more. I'll leave it to you to find them out. To succeed at this challenge, you don't need to write a thesis about the economics of the south bay, just sketch the merest outlines of how the landings worked. Search (and make sense!) on!